During the month of September 2006 I had a retrospective exhibition at the Birmingham-Bloomfield Art Center in Michigan. For this event titled: "Looking Back-Making Now 42 Years in Clay," we designed and produced a color catalogue. What you can expect to find in this catalogue is a photo survey of works spanning this period of my career with captions and a modest amount of supporting text. There are 48 full color images. You may order this catalogue in either soft bound or hard cover. Made on a Mac! These are custom-printed on demand, so we are ordering them as they are requested. Please allow about 2-3 weeks for delivery. ORDER AT: johnglick@johnglick.com. Payment by VISA, MC or Check. "Craft in America: Expanding Traditions": National Invitational Touring Exhibition and Book. Eight city, two year tour. "Cityscape/Landscape, A Group Exhibition": The Clay Studio, Philadelphia, PA.
"Plates & Platters: Salon Style": The Clay Studio, Philadelphia, PA.
"Evolution-Nine With One": Recent works by John Glick and nine of his former assistants. Red Lodge Clay Center Gallery, Red Lodge, MT. Invited artists: Mark Derby, Thomas Rohr, Mary Engel, Curtis Stewardson, Kristen Kieffer, Jennifer Everett, Kirke Martin, Mark Cole, Paul Young. 20th Anniversary of Watershed Center for Ceramic Arts: Invitational Exhibition, The Society of Arts and Crafts, Boston, MA. "The Yixing Effect: Echoes of the Chinese Scholars": Holter Museum of Art, Helena, MT. Touring Exhibition. "La Mesa": National Invitational of Dinnerware at N.C.E.C.A. Louisville, KY. Organized by Santa Fe Clay. 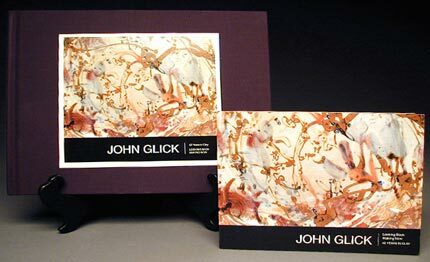 "John Glick: Looking Back-Making Now, 42 Years in Clay": Birmingham-Bloomfield Art Center, Birmingham, MI. Sept 8-29, 2006. Color catalogue available (see above). "Made by Hand, Meant for Use": National Juried Competition for Ceramics. Andrews University, Berrien Springs, MI. "National Teapot Show VI": Cedar Creek Gallery, Creedmoor, NC. "Diverse Domain-Contemporary North American Ceramic Art": N.C.E.C.A. Invitational Exhibition, Taipei County Yingge Ceramics Museum, Taipei County. Platters & Plates: "The Blue Plate Special" Chester Springs Studio, Chester County, PA.
"Tea Time: The Art of the Teapot": Kalamazoo Institute of Arts, Kalamazoo, MI. "When Form Meets Function": Ella Sharp Museum, Jackson, MI Group invitational. "Wall Works" National Juried exhibition. M. Sherrill, Juror. Baltimore Clayworks, Baltimore, MD. "21st Century Ceramics in the United States and Canada" Invitational exhibition. William Hunt, Curator. Columbus College of Art & Design, Columbus, OH. "Table for Two/ Tea for Tea": Invitational The Clay Studio, Philadelphia, PA.
"Great Pots: Contemporary Ceramics from Function to Fantasy" Newark Museum of Art, Newark, NJ. "The Art of Fine Craft": Nebraska Wesleyan University, Elder Gallery Lincoln, NE. "Poetics of Clay" Philadelphia Art Alliance, Sept-Nov 2001, Philadelphia, PA, and Museum of Art And Design, Helsinki, Finland, Jan- April 2002. "Objects for Use/Handmade by Design" Invitational exhibition. American Craft Museum, New York, NY. "American Shino" Invitational exhibition. Babcock Galleries, New York, NY and Tour. "Surface Tensions" Shino Invitational. Northern Clay Center, Minneapolis, MN. "Enhancements: Handcrafted Functional Objects" Exhibits USA. Mid-America Arts Alliance Tour. "The Yixing Effect" The Art Complex Museum, Duxbury, MA. Touring portion. "Strictly Functional" Pottery National, Lancaster Museum of Art, Lancaster, PA.
"Sublime Servers" Baltimore Clay Works, Baltimore MD, and Greenwich House Pottery, New York, NY. "Color and Fire: Defining Moments in Studio-Ceramics, 1959- 2000" The Los Angeles County Museum of Art, Los Angeles, CA and Tour. "Reliquaries For America" San Francisco Craft & Folk Art Museum, San Francisco, CA. "Pacific Tides: The Influence of the Pacific Rim on Contemporary American Ceramics" Lancaster Art Museum, Lancaster, PA.
"Tea �n' Trompe: The Influence of Traditional Trompe L'Oeil Teapots on Contemporary Crafts" Craft Alliance, St. Louis, MO. Yixing Museum, International Conference, Yixing, China. Michigan Ceramics, Center for Creative Studies, Detroit, MN and Tour. "Tea Bowl Invitational" San Francisco Craft & Folk Art Museum, San Francisco, CA. "Tea Bowl: Imperfect Harmony" The Greater Lafayette Museum of Art, Lafayette, IN. "Ceramic Still Life: The Common Object" Oliver Art Center, California College of Arts and Crafts, Oakland, CA. "Master Potters from the Heartland," Emison Gallery at DePauw University, Greencastle, IN. "In Praise of Craft" James Renwick Alliance, Renwick Gallery, Smithsonian Institution, Washington, DC. "Asian Roots/ Western Soil: Japanese Influences in American Culture" Berkeley Art Center, Berkeley, CA. Fletcher Challenge Ceramics Award Exhibition, Aukland, New Zealand. The Studio Potter 20th Anniversary Collection Exhibition and Catalogue. "Built, Thrown and Touched: Contemporary Clay Works," Mid-America Arts Alliance Tour. Oct. 91-Oct. 95. "Wood Spirits" Galeria Mesa, Mesa Arts, Center, Mesa, AZ and Tour. "Collaboration in Print, Stewart & Stewart Prints: 1980-1990" Inaugural Showing, Detroit Institute of Arts, Detroit, MI and Tour. "A Retrospective Selection Plus Recent Works" Fosdick-Nelson Gallery School of Art and Design, New York College of Ceramics at Alfred University, Alfred, NY. One Person Exhibition. "Art That Works: The Decorative Arts of the Eighties Crafted in America" Curator: Lloyd E. Herman. Touring Exhibit 1990-1992. "Fragile Blossoms, Enduring Earth: The Japanese Influence on American Ceramics" Everson Museum of Art, Syracuse, NY and Tour. "Surface and Form" National Museum of Ceramic Art, Baltimore, MD. "Power over the Clay" Detroit Institute of Arts, Detroit, MI. "Clay Today: Contemporary Ceramists and Their Work" Catalogue of the Howard and Gwen Laurie Smits Collection, Los Angeles County Museum of Art, Los Angeles, CA. "Fired with Enthusiasm" Tureen Invitational, Campbell Museum, Camden, NJ, and Tour. "Craft Today: Poetry of the Physical" Inaugural Exhibition American Craft Museum, New York, NY. "Contemporary Arts: An Expanding View" Monmouth Museum of Art, Lincroft, NJ, and Squibb Gallery, Princeton, NJ. "Surface, Function, Shape" Selections from the Earl Millard Collection, Southern Illinois University, Edwardsville, IL. "13th Chunichi International Exhibition of Ceramics Arts" Nagoya, Japan. Bowl (1977) on loan from collection of Everson Museum of Art, Syracuse, NY. Craftsmen Potters Association Gallery, London, England. One Person Exhibition. 26th National Exhibition, New Zealand Society of Potters. Invited Foreign Potter. "Cranbrook Ceramics: 1950-1980" Cranbrook Academy of Art, Bloomfield Hills, MI. "Soup, Soup, Beautiful Soup" Tureen Invitational (Invited Section) Campbell Museum, Camden, NJ. "American Crafts in Iceland" Kjarval Stadir Museum, U.S. Embassy, Iceland. "Fifth National Invitational Crafts Exhibition" Skidmore College, Saratoga Springs, NY. "Beyond Tradition" 25th Anniversary Exhibition, American Craft Museum, New York, NY. "American Potters" Garth Clark Gallery, Los Angeles, CA. "Spouting ideas" John Michael Kohler Arts Center, Sheboygan, WI. "The Contemporary American Potter: New Vessels" University of Northern Iowa, Cedar Falls, IA. National Touring Exhibit, Garth Clark, Curator. "Robert L. Pfannebecker Collection" Moore College of Arts, Philadelphia, PA.
"For the Table Top" American Craft Museum, New York, NY, and National Tour. "Contemporary Ceramics, A Response to Wedgewood" Museum of the Philadelphia Civic Center, Philadelphia, PA, and Tour. "A Century of Ceramics in the United States 1878-1978" Everson Museum of Art, Syracuse, NY and Tour. 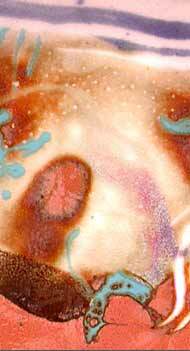 "New Works In Clay II" Syracuse University, Syracuse, NY, Group Exhibition. Renwick Gallery, Smithsonian Institution, Washington, DC. Craft and Folk Art Museum, Los Angeles, CA. Museum of Contemporary Crafts, New York, NY. John Michael Kohler Arts Center, Sheboygan, WI. Everson Museum of Art, Syracuse, NY. "Approaches To Function" Exhibition with Robert Turner, Ann Currier and John Glick, Exhibit A, Gallery of American Ceramics, Evanston, Illinois. "Eight Independent Production Potters" Invitational Exhibition, Kansas City Art Institute, Kansas City, MO. "12 In Clay" Alumni Ceramic Invitational Exhibition, Cranbrook Academy of Art, Bloomfield Hills, MI. "Tureens" National Invitational Exhibit, Campbell Museum Camden, NJ and Tour. "Ten Year Retrospective Exhibition: John Glick" Pewabic Pottery, Detroit, MI. "Beaux Arts/Designer Craftsman '73" Purchase award for Permanent Collection of Columbus Gallery of fine Arts. Columbus, OH. "Ceramics International 73" Edmonton, Alberta, Canada. United States Information Agency Touring Exhibition, assembled for four Embassy Collections. Four Teapots selected. "Beaux Arts Designer/Craftsman '72" Ceramics Monthly Magazine Purchase Award for tea pot. Ceramic Box selected for two year National Tour of A.C.C. North Central Region. "Four in Clay" Robert Turner, Paulus Berensohn, John Glick, Susanne Stephenson. Invitational at Community Art Center, Wallingford, PA.
"Objects U.S.A." Johnson's Wax Co. Collection and inclusion in the Biographical book published by Viking Press, and Tour 1969-1972.